As a new parent, you suddenly become bombarded with a plethora of baby products and (often unsolicited) advice. But as a first-timer, it can be hard to distinguish the must-haves from the gimmicks. Likewise, the tips and tricks that worked for others may not be conducive to you and your new bundle of joy. With that in mind, here are four hacks to make the transition to parenting a little easier to manage. Your new bundle of joy no doubt craved being in the womb, but life doesn’t just stop after you’ve given birth. Of course, there’s still cleaning and cooking to do, other kids to look after, and often work to catch up on. You may get a break for the first few weeks, but soon enough you’ll need to figure out a rhythm to get it all done with a new baby on board. If you need a little assistance carrying your newborn, an age-old practice could provide immense, mutually-desired enjoyment. In fact, embracing babywearing can help you get more done, while also meeting your baby’s needs. Furthermore, studies have shown that moms who practice babywearing for three hours a day see their infant cry 43 percent less than babies who didn’t receive the same — or any — amount of nurturing. One of the most comfortable carriers for little ones is the Solly Baby Wrap, an ultra-thin stretchy wrap designed for use throughout your child’s first year. Tula also makes a variety of carriers to make babywearing comfortable and seamless. And, most carriers can even be used for discreet and convenient hands-free nursing, too. Sure, we all know swaddling babies is a great way to soothe and prevent them from startling themselves awake. However, because babies tend to wiggle out of this cozy wrapping, swaddling is a battle many babies end up winning. To decrease the chances of your baby popping free, keep them securely swaddled — and ultimately asleep longer — by using swaddle suits instead of traditional swaddle blankets. 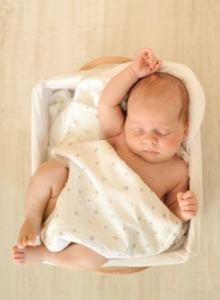 Love to Dream makes one of the most popular options, the Swaddle Up, which features an ultra soft, stretchy material and a two-way zipper to make nighttime diaper changes a breeze. With this genius design, babies can keep their hands near their face for comfort. Plus, the Swaddle Up is light enough to be worn over the top of the baby’s sleepwear. There’s an app for nearly everything these days — and there are certainly no shortage of options aimed at parents. To ease the stress of tracking all of your baby’s newfound habits, you can leverage this type of technology with an app like Total Baby. For example, you can use this app to easily keep track of feedings, soiled diapers, sleep times and baths. Meantime, because your child will start to grow up before you know it, use an app like FirstYear or Baby’s Firsts to record all of your baby’s precious milestones, from their first smile to their first steps. You can also keep your baby soothed by loading your smartphone with gentle melodies to the tune of popular hits with the online program, Rockabye Baby. Likewise, if your baby needs some white noise to fall asleep or calm down, your best bet is to download an app that provides some ambient white noise. Ultimately, whatever works best for your little one, be sure you can download musical tracks for offline play to avoid exceeding your data limit on your smartphone plan. You know to never leave home without a change of clothes for your baby, but what about for yourself? After all, when you’re constantly holding, rocking or changing your little one, it’s only a matter of time before you get covered in spit up, urine or a blown out diaper. Your best bet? Stash a spare shirt for yourself in your diaper bag, so you can quickly change when your precious bundle of joy doles out a wardrobe malfunction. Having a baby can be nerve-wracking and overwhelming, especially for first-time parents. It’s estimated to take new mothers up to 4 whole months to get the hang of motherhood so, if you’re a first-time parent and are struggling to manage, it’s totally normal! In addition to love and care, babies also require a lot of material possessions too. With an average of $12,000 being spent during a baby’s first year of life, it’s essential you spend wisely and don’t waste your hard-earned money on pointless items. If you’re a new parent struggling to establish which purchases are necessary and which aren’t, here’s a few key tips to ensure you buy the most useful items for your baby. For first-time parents, having a baby is a completely new experience. It can be difficult to know exactly what you need and what you don’t, so here’s a few must-have items to make sure you have ready for when your little one arrives. Diapers – A common essential, but many new parents underestimate the amount of diapers their baby will go through. It’s estimated a baby will go through 10-12 diapers a day during the first few weeks of life, so ensure you have enough stocked up. Clothes – We all want our babies to look cute, but comfort is more important. Opt for comfortable, breathable fabrics and an array of different clothing sizes. Sizes will vary from brand to brand, so it’s a good idea to get a couple of different sizes to establish which fits best on your baby. Car seat – An absolute essential as without one, you can’t safely drive your baby anywhere. Stay away from a second-hand seat and ensure to purchase the correct type for your baby’s age. Visit this site to discover a variety of spacious, family-friendly cars ideal for car seat fitting. Whilst the baby market is saturated with new and upcoming products, not everything is wholly necessary or appropriate for a new-born baby. Here’s a few items you should avoid purchasing. Blankets – A popular gift-choice, fluffy blankets can actually cause more harm than good. They put your baby at risk of overheating and can cause them to feel very claustrophobic. If you are going to get a blanket, opt for a thinner swaddling-type blanket instead. Toys – Whilst a huge essential when your baby gets a little older, toys are often a waste of money for newborns. They’re far too young to properly engage with anything other than your voice and face, so save the toy buying until your baby is old enough to properly use them. Shoes – If a baby can’t walk, why bother with shoes? A pair of cozy socks will be more than sufficient for a new-born. Having a baby for the first time is a huge life milestone, and it’s important to spend wisely and be as prepared as possible. As long as you don’t waste your money on unnecessary items and only buy the vital essentials to begin with, you’re sure to have a happy baby as well as a happy bank balance! If you’re about to welcome your first child into the world, you’re probably overwhelmed with thoughts of feeding times and crib safety measures. Let these four apps take away some of the stress! This “baby logging” app will keep track of all the details that you’re too busy or too tired to write down. From bath times to changing schedules, all you have to do is input the data and let Total Baby work its recording, archiving and organizing magic. You can even monitor things like immunizations and growth charts when you utilize the app’s tracking utilities. Though not technically a baby app, DecorPad can help you get your home in order before the newest member of your family arrives. Offering all kinds of pictures and galleries from top interior designers, you’ll be able to re-create or re-design your entire home from frontroom furnishings to nursery paint colors. Just make sure that you get it all done before you go into labor! This day-by-day app will help you track and record every moment of your pregnancy and first year as a parent. Not only will you enjoy things like countdowns, health tips, daily calendars, sonogram images and time-lapse videos of your belly, but you’ll also be able to connect with other moms-to-be who are expecting at the same time as you. Share your joys, triumphs and milestones with a community of like-minded people who will support your parental journey just as much as you support theirs. Say goodbye to bulky baby monitors! Cloud Baby Monitor is a wireless, cloud-based app that can be integrated with all Apple devices, including iPhones, iPads and Apple TVs. It will keep you attuned to all of your baby’s sounds and movements with a wide variety of features such as motion alerts and noise level indicators. It even offers two-way microphones and remote night lights with adjustable controls if you want to soothe your baby from another room! Now that’s the kind of convenience that you need during a 2AM wake-up call. These are just four apps that will help you prepare for your little bundle of joy. It will be a challenging period in your life, but with the help of useful and up-to-date technology, it doesn’t have to be a stressful one! A trampoline is an ideal way to get children to play outside. It might seem dangerous, but there are several ways to add a bit of safety while children are on them. You can purchase nets that can be added to the sides so that children don’t fall off. Place guards over the springs to prevent pinching and to prevent children from slipping between the sets of coils. Before buying a trampoline, it’s really important for you to check out some reviews such as 9 Best Trampolines – Top Reviews 2018. There are a few trampoline accessories that you want to keep on hand. Springs can break if there is a lot of pressure applied to them. You can often get an entire set at a retail or hardware store so that you can immediately replace the springs when they break. A fun accessory that you can add is a basketball hoop. The hoop attaches to the netting that is installed around the trampoline. It is sturdy and will likely provide hours of entertainment for children. A ladder usually doesn’t come with the set, but it’s a good investment so that children aren’t injured when they get on the equipment. Children can camp out on the trampoline when you add a tent that secures along the edges of the equipment. There is a large opening that zips close, keeping children from falling off the side. This is truly useful while they are playing and telling stories at night before settling into sleeping bags. 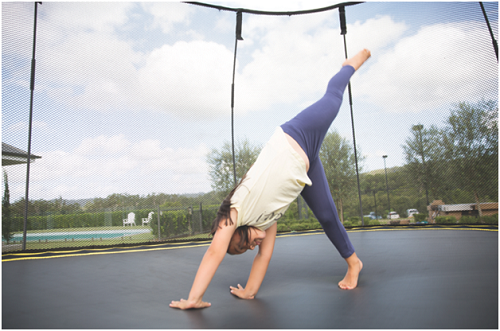 Owning a trampoline gives children a reason to spend time outdoors. There are so many video games that keep children inside the house. Playing on a trampoline is a way for them to get fresh air. It’s also a good way to get the exercise that they need to strengthen the circulatory system along with the skeletal and muscular systems. The trampoline will likely keep older children at home, playing with their friends instead of wanting to go out of the house. Sometimes, children don’t get to spend enough time with their friends because of school, sports and family activities. When they do find time to spend with friends, they would often opt to stay in cool hangout places. Having a trampoline at home instantly makes your place the cool place to be in. It’s definitely an easy way to make sure your children stay out of trouble and have fun with their friends at the same time.